Aug. 27, 2018 (Phys.org) -- A geographic profiling tool used to catch serial criminals could help reduce the casualties of human-tiger conflict, according to scientists who collaborated on an innovative conservation research study. 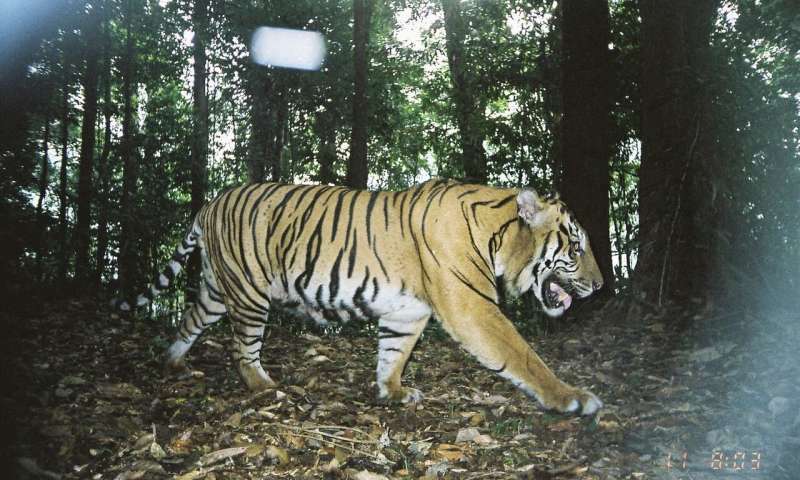 The results of their research, published in Nature Communications, help explain how villagers in Sumatra coexist with tigers. If used pre-emptively it could have helped cut attacks by half, saving tigers from poaching and retaliation killings. Dr. Matthew Struebig at the University of Kent's Durrell Institute of Conservation and Ecology, in its School of Anthropology and Conservation and Dr. Freya St. John at Bangor University, led a collaboration between spatial ecologists and social scientists to help predict where human-tiger conflict interventions could be most effective. Tigers are on the brink of extinction due to deforestation and persecution. They are highly threatened and pose a public threat, but in Sumatra tigers continue to coexist with people, offering insights for managing dangerous wildlife elsewhere. Millions of conservation funds are spent each year trying to reduce people's risk of encountering harmful animals, and mitigating livestock losses of local farmers.